(apparently the culprit is something called "technodisco.net"
Firefox and McAfee too - "may try to steal your information." Firefox / Norton here. Same 'deceptive site' message, even when going directly to technodisco.net. I'm not getting a warning about anything. 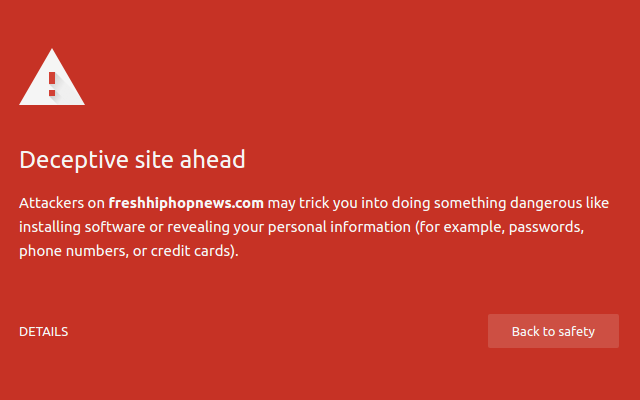 When you try it, is there a particular site that is getting flagged? I was getting this on Safari for www.ilxor.com. maybe want to check this out, getting sent to a suspicious website on the Avengers thread. I'm using Safari. Newly registered user, first ever post, Dropbox link. It may be nothing but it smells fishy to me. I googled them up based on their email when they registered because we've been getting a ton of spammers lately and I just check everyone. They're actually just a huge Joan Didion fan, as per the username. Cool, thanks. Better safe than sorry. There was a linked image from technodisco.net on there, which I've deleted now. Can you check that theead again and let me know if it's still happening? Thread is so borked I'll have to get stet to look at it -- I get the same warning and then it refuses to finish loading.